The interpretation of al-idnaa' in the verse of the Jilbab to mean "covering the face". This misinterpretation is contrary to the basic meaning of the word in Arabic which is "to come close", as is mentioned in authoritative dictionaries like al-Mufradaat by the well-known scholar, ar-Raghib al-Asbahani. However, there is sufficient evidence in the interpretation of the leading commentator on the Quran, Ibn 'Abbas, who explained the verse saying, "She should bring the Jilbab close to her face without covering it." It should be noted that none of the narrations used as evidence to contradict this interpretation are authentic. 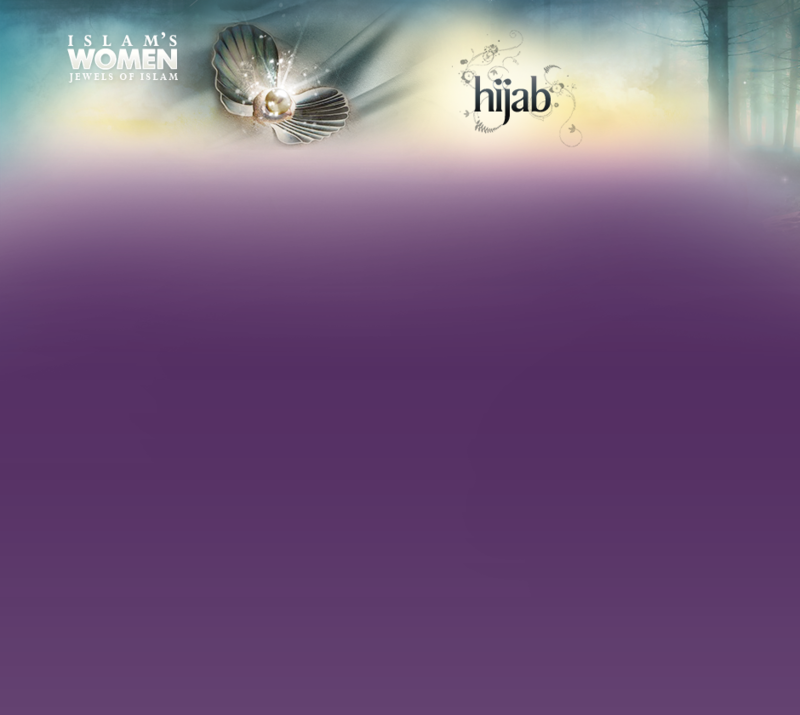 The interpretation of Jilbab as "a garment which covers the face." The claim that the khimar (headscarf) covers the head and the face. In doing so "the face" has been arbitrarily added to its meaning in order to make the verse: "Let them drape their headscarves over their bosoms" appear to be in their favor, when, in fact it is not. The word khimar linguistically means only a head covering. Whenever it is mentioned in general terms, this is what is intended. For example in the Hadiths on wiping (mas-h) on the khimar and the prophetic statement, "The salah of a woman past puberty will not be accepted without a khimar." This Hadith confirms the invalidity of their misinterpretation, because not even the extremists themselves - much less the scholars - use it as evidence that the covering of a woman's face in salah is a condition for its validity. They only use it as proof for covering the head. Furthermore, their interpretation of the verse of the Qawaa'id "... to remove their clothing" to mean "Jilbab" further confirms it. They hold that it is permissible for old women to appear before marriageable males in her headscarf with her face exposed. One of their notable scholars openly stated that. As for Sheikh at-Tuwaijri, he implied it without actually saying it. After checking the opinions of the early and later scholars in all the specializations, I found that they unanimously hold that the khimar is a head covering. I have mentioned the names of more than twenty scholars, among them some of the great Imams and Hadith scholars. For example, ;Abul-Walid al-Baji (d. 474 AH) who further added in his explanation, "Nothing should be seen of her besides the circle of her face." The claim of a consensus (Ijma') on the face being considered 'Awrah. Sheikh at-Tuwaijri claimed that scholars unanimously held that the woman's face was 'Awrah and many who have no knowledge, including some Ph.D. holders, have blindly followed him. In fact, it is a false claim, which no one before him has claimed. The books of Hambalite scholars which he learned from, not to mention those of others, contain sufficient proof of its falsehood. I have mentioned many of their statements in Ar-Radd. For example, Ibn Hubayrah al-Hambali stated in his book, al-Ifsah, that the face is not considered 'Awrah in the three main schools of Islamic law and he added, "It is also a narrated position of Imam Ahmad." Many Hambalite scholars preferred this narration in their books, like Ibn Qudamah and others. Ibn Qudamah in al-Mughni explained the reason for his preference saying, "Because necessity demands that the face be uncovered for buying and selling, and the hands be uncovered for taking and giving." Among the Hambalite scholars, is the great Ibn Muflih al-Hambali about whom Ibn Qayyim al-Jawziyyah said, "There is no one under the dome of the sky more knowledgeable about the school of Imam Ahmad than Ibn Muflih." And his teacher, Ibn Taymiyyah, once told him, "You aren't Ibn Muflih, you are Muflih!" "Is it correct to chastise marriageable women if they uncover their faces in the street? Regarding the Hadith of Jarir in which he said, "I asked Allah's Messenger about the sudden inadvertent glance and he instructed me to look away." Al-Qadi 'Iyad commented, "The scholars, May Allah Most High have mercy on them, have said that there is proof in this Hadith that it is not compulsory for a woman to cover her face in the street. Instead, it is a recommended sunnah for her to do so and it is compulsory for the man to lower his gaze from her at all times, except for a legislated purpose. Sheikh Muhyud-din an-Nawawi mentioned that without further explanation." Then al-Muflih mentioned Ibn Taimiyyah's statement which at-Tuwaijri relies on in his book[page 170], while feigning ignorance of the statements of the majority of scholars. Statements like those of al-Qadi 'Iyad and an-Nawawi's agreement with it. Then al-Muflih said, "On the basis of that, is chastisement legal? Chastisement is not allowed in issues in where there is a difference of opinion, and the difference has already been mentioned. As regards our opinion and that of a group of Shafi'ite scholars and others, looking at a marriageable woman without desire or in a secluded circumstance is permissible. Therefore, chastisement is not proper." "... Whoever permits women to expose their faces and uses the proofs of al-Albani has flung open the door for women to publicly flaunt their beauty and emboldened them to commit the reprehensible acts done by women who uncover their faces today." And on page 233 he said, "... and to disbelief in the verses of Allah." Those are his words - May Allah reform him and guide him. What would he say about Ibn Muflih, an-Nawawi, al-Qadi 'Iyad and other Palestinian scholars, as well as the majority of scholars who preceded them and who are my salaf regarding my opinion on this matter? The agreement of at-Tuwaijri and the extremists with him to explain away the authentic Hadiths which contradict their opinion. At-Tuwaijri did this with the Khath'amiyyah Hadith. They developed a number of comical methods to nullify its implications. I have refuted them all in ar-Radd and one of them in Jilbab al-Mar'ah al-Muslimah. Some reputable scholars have said that the Hadith doesn't contain a clear statement that her face was exposed. This is among the farthest opinions from the truth. For, if her face wasn't exposed, where did the narrator or the viewer get the idea that she was beautiful? And what was al-Fadl repeatedly looking at? The truth is that this is among the strongest and most clear proofs that a woman's face is not 'Awrah. In spite of that, there remains a group that insists that she was in ihram while knowing that her ihram does not prevent her from draping some of her clothing over her face. At-Tuwaijri does accept sometimes that her face was uncovered but he cancels its implication by saying, "There is no evidence in it that she continuously exposed her face!" He means that the wind must have exposed her face and at that instant al-Fadl ibn 'Abbas saw it. Is it possible for an Arab to say that after reading in the Hadith "al-Fadl began to stare while turning towards her," and in another narration "... so he began to look at her and her beauty amazed him." Isn't this pride with two protruding horns? At other times at-Tuwaijri interprets it as al-Fadl looking at her size and stature. The frequent use of inauthentic Hadiths and unreliable narrations. For example, the Hadith of Ibn 'Abbas about exposing only one eye is commonly used by those who insist that women are obliged to cover their faces in spite of their knowledge of its in-authenticity. In fact, one among them also declared it inauthentic. Perhaps the most important of these unreliable Hadith commonly used as evidence is the one in which the Prophet is reported to have said, "Are you both blind?" They blindly followed at-Tuwaijri and the others in claiming that this inauthentic narration was strengthened by other supportive narrations and that it was evidence for the prohibition of women from looking at men, even if they are blind. They took this position in spite of the fact that the narration was classified inauthentic by the leading verification experts among the Hadith scholars like, Imam Ahmad, al-Bayhaqi and Ibn 'Abdil-Barr. Al-Qurtubi related that the narration was not considered authentic among the scholars of Hadith. Consequently, many Palestinian hambalite scholars made their rulings on that basis. Furthermore, that is what the science of Hadith and its methodology requires as was clearly stated in al-Irwaa. However, in spite of all that evidence to the contrary, Sheikh 'Abdul-Qadir as-Sindi had the nerve to go along with Sheikh at-Tuwaijri and others and claim that its chain of narration was authentic. By doing that he exposed himself and his ignorance or feigned ignorance. It is unfortunate that he took this position, because the Hadiths chain contains an unknown narrator from whom only one person narrated along with its contradiction to what leading scholars have narrated. Contrary to the level of scholarship that we are used to from Sheikh as-Sindi, he has brought in support of his claim the most amazing things. He arguments unexpectedly contain deception, misguidance, blind following, hiding knowledge and turning away from his own fundamental principles. Among the amazing positions is Sheikh as-Sindi's feigned ignorance that the narration contradicts the Hadith of Fatimah bint Qais which contains the Prophet's permission for her to stay at the home of the blind companion, Ibn Umm al-Maktum, whom she would be able see. The Prophet gave the reason for that instruction in his statement to her, "For if you take off your head scarf, he won't see you." In at-Tabarani's narration from Fatimah, she said, "He instructed me to be at Ibn Umm Maktum's home because he couldn't see me whenever I took my head scarf off." There are also a number of other unreliable Hadiths gathered by at-Tuwaijri in his book. I mentioned ten of them in my response, and among them are some fabricated traditions. The classification of some authentic Hadiths and confirmed narrations from the Companions as inauthentic. The extremists have declared well-established reliable narrations as unreliable and feigned ignorance of strengthening narrations. They have further declared some narrations extremely inauthentic, like the Hadith of Ayshah concerning the woman who reaches puberty, "Nothing should be seen of her besides her face and hands." They have persistently declared it inauthentic - the ignorant among them blindly following others devoid of knowledge. In so doing, they contradict those among the leading scholars of Hadith who strengthen it like Al-Bayhaqi and Ath-Thahabi. Most of them, including some prominent scholars, feign ignorance of its various chains of narration. In fact, at-Tuwaijri openly stated on page 236 of his book that this statement was only narrated in Ayshah's Hadith. Even though he has seen with his own eyes on pages 57-9 of my book two other chains: one of which is from Asma bint 'Umays and the other from Qatadah in the abbreviated (Mursal) format with an authentic chain of narration. Many of the blind followers followed him, including some female authors as in Hijabuki ukhti al-muslimah [Your veil, my sister Muslim], page 33. They also pretend to be ignorant of the leading Hadith scholars and others who strengthened it, like al-Munthiri, az-Zayla'i, al-'Asqlani and ash-Shawkani. Some of those who promote themselves as being among the well versed in this noble science - in their forefront Sheikh as-Sindi - claim that some of its narrations are extremely weak and unreliable in order to escape from the Hadith science rule that 'unreliable narrations are strengthened by narrations similar to them'. In doing that, they delude their readers into thinking that no one ruled the weak narrators, like 'Abdullah ibn Lahi'ah, trustworthy and that they cannot be used as supportive evidence. In doing that, they contradict the methodology of the Hadith scholars in using supportive evidence. Among them is Imam Ahmad and Ibn Taymiyyah - may Allah have mercy on them. Likewise, they all feign ignorance that the scholars - among them Imam ash-Shafi'i -confirm the Hadith Mursal if most scholars use it as evidence, as is the case of Ayshah's Hadith. The Hadith has been narrated by Qatadah from Ayshah. It has been narrated in another chain from Asma. All three narrators of the Hadith ruled according to it. Qatadah stated in his interpretation of the verse on draping, "Allah has placed on them the requirement to cover the eyebrows," That is, "and not on their faces" as stated by at-Tabari. Ayshah said, regarding the female in ihram, "She may drape the garment on her face, if she wishes." This was narrated by al-Bayhaqi in an authentic chain of narrators. There is clear evidence in Ayshah's giving the female pilgrim a choice in draping that in her opinion the face was not 'Awrah. Otherwise she would have made it obligatory on them as those who contradict it do. Because of their position, most of the extremist authors, with at-Tuwaijri in the forefront, hid this statement of Umm al-Mu'minin, Ayshah from their readers. The author of Faslul-khitab [The Definitive Statement] deliberately deleted this portion of al-Bayhaqi's narration in his book. This being only one of a number of similar disreputable acts which I have exposed in my book. The supportive evidence is that this authentic narration from her strengthens her Hadith from the Prophet. This is among the facts that people are unaware of or they pretend ignorance of, either choice is bitter to swallow. As for Asma, it has been authentically reported from Qays ibn Abi Hazim that he saw her as a woman of white complexion with tattoos on her hands. The narration of Ibn 'Abbas earlier mentioned, "She should pull the Jilbab (cloak) close to her face without putting it on her face." His interpretation of the verse of adornment "...except what appears from it" as referring to" the face and hands" was similar. There is also a similar narration from Ibn 'Umar to the same effect. At this point, a bitter reality must be noted due to the lessons which may be gained from it, the knowledge which it contains and is service as a reminder of the wise saying: "The truth is not known by people, know the truth and you will know people." At the same time that Sheikh at-Tuwaijri insists on rejecting the Hadith of Ayshah and its supporting evidences, among them Qatadah's Mursal narration, he willingly accepts another inauthentic Hadith from her with Mursal support. In that Hadith it is mentioned "...that she wore a niqab (face veil)..." and that she was supposed to have described the Prophet's wife Safiyyah and the Ansar women as "... a jewess among jewesses..." which is considered by scholars to be a very erroneous statement (munkar jiddan). The Sheikh argues on page 181, "It has Mursal supportive evidence," and quotes one of the Mursal Hadiths of 'Ata containing a known liar in its chain of narration. One should reflect on the great difference between this fabricated supportive evidence and the authentic supportive evidence of Qatadah further supported by other evidences, then ask, "Why did at-Tuwaijri accept the second Hadith of Ayshah and not the first?" The obvious answer is that the accepted one contains reference to wearing the niqab - even though it does not indicate obligation - while the rejected one denies it. Thus, in this regard, the Sheikh did not base his position on Islamic legal principles, but on something similar to the Jewish principle: The ends justify the means. May Allah help us. Among the amazing practices of some latter day blind following hanafite scholars and others is that on one hand they agree with us regarding the permissibility of women exposing their faces, because that was the position of their Imams, but on the other hand they agree with the extremists in opposition to their Imams. They make ijtihad (while claiming taqlid) by adding the condition that the society be safe from fitnah to the position of the Imams. This refers to the fitnah caused by women to men. Then one of the ignorant contemporary blind followers went to the extreme of actually attributing this "condition" to the Imams themselves. Among some of those having no knowledge, this resulted in their concluding that there is essentially no difference between the position of the Imams and the extremists. It is obvious to jurists that this condition is invalid because it implies that humans know something which the Lord missed knowing. That is, the temptation of women did not exist during the time of the Prophet (peace and blessings be upon him) thus we had to create a special ruling for it which did not exist previously. In fact, the fitnah did exist during the era of divine legislation and the story of al-Fadl ibn 'Abbas' trial with the Khath'amiyyah woman and his repeated looking at her is not far from the readers' memories. It is well known that when Allah Most High instructed men and women to lower their gazes and instructed women to veil themselves in front of men, He did that to block the road to corruption and prevent temptation. In spite of that, He - Most Great and Glorious - did not command that they cover their faces and hands in front of them. The Prophet (peace and blessings be upon him) further emphasized that in the story of al-Fadl by not commanding the woman to cover her face. And Allah was truthful when He said, "And your Lord is not forgetful." The reality is that the condition of there not being fitnah was only mentioned by scholars regarding the man's looking at the woman's face, as in al-Fiqh 'ala al-mathahib al-arba'ah, page 12. They said, "That [the woman's face may be uncovered] is permissible on condition that there is safety from temptation," and that is true, contrary to what the blind followers practice. They conclude from it that the woman is obliged to cover her face, when in fact it is not a necessary consequence. They know that the condition of safety from temptation also applies to women. For it is not permissible for them to stare at a man's face except where there is safety from temptation. Is it then a necessary consequence that men also veil their faces from women to prevent temptation as some tribes called the Tawareg do. They would have a basis in fiqh of the Quran and Sunnah if they said that a woman veiled in correct Jilbab who fears being harmed by some corrupt individuals due to her face being exposed is obliged to cover her face to prevent harm and temptation. In fact, it could even be said that it is obligatory on her not to leave her home if she feared that some evil authorities supported by a leader who does not rule by what Allah revealed, as exists in some Arab countries since a few years ago, would pull her Jilbab from her head. As to making this obligation a compulsory law for all women everywhere and in all eras, even if there did not exist any harm for veiled women, No. Absolutely not. Allah was truthful when He said, "Do they have partners who legislated for them in the religion what Allah did not permit?" These are the most significant of the extremist opposition's mistakes which I thought needed brief mention due their strong link to the contents of this book. I then closed ar-Radd al-Mufhim with a reminder that extremism in the religion - considering that the Wise Legislator forbade it will not bring any good. And it is not possible for it to produce a generation of young Muslim women carrying Islamic knowledge and practice moderately balanced, with neither excesses nor deficiencies. Not like what I have heard about some young female adherents in Arab countries when they heard the Prophet's statement, "The woman in ihram should neither wear a niqab nor gloves," they did not accept it saying instead, "We will wear our niqabs and gloves!" No doubt, this was a direct result of the extremist views which they heard regarding the obligation of covering their faces. I certainly cannot imagine that this type of extremism - and this is only one example from many which I have - can possibly produce for us Salafi women able to do everything their religiously guided social life demands of them in a way similar to the righteous women of the Salaf.